Everything is getting shaken up this summer at the Northern NeXus of Adventure including our new approach to Counselors-in-Training. All aspects of the Northern NeXus are being re-evaluated, including the CIT program that has been historically offered. Beginning this year, CIT’s at T.L. Storer and Wah-Tut-Ca Scout Reservation will become more a part of the camp staff than ever before. Now 14 year-olds will have the opportunity to experience a full summer learning at camp by participating in all staff activities from Staff Week all the way through take down, at no cost to the CIT. Also as part of the new CIT experience, all participants in the program will attend the exclusive Staff Training and Growth Course (STAG) which will teach CIT’s leadership and team working skills through the Rare Adventures of T.L. Storer and Wah-Tut-Ca. 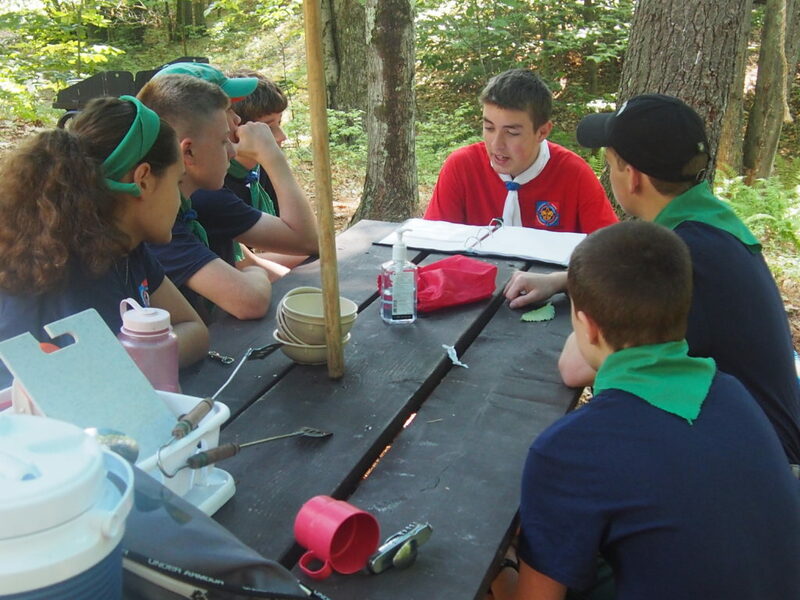 The opportunities presented by the NeXus make this program unique in Boy Scouts. When I was fourteen I would have loved an opportunity like this. During my own summer as a CIT at Wah-Tut-Ca Scout Reservation I had a lot of fun but this course was built to surpass that experience in every way imaginable. As a former staff member at the National Youth Leadership Training Course, a participant at Philmont’s National Advanced Youth Leadership Experience and a veteran of five years of camp staff at 3 camps, I was able to draw from a large box of involvement to develop a program that applies to the type of leadership needed not only for camp, but also for life. Some activity examples are Search and Rescue Training, Challenging Outdoor Personal Experience challenges, a youth planned backpacking outpost to a mountain in the NeXus and much more. Another great benefit of this program stems from its change in the role of a CIT from a learning-camper to an apprentice staff member. By attending and participating in Staff Week, CIT’s will learn all the staff specific trainings and integrate fully into the camp staff. Following the completion of the STAG Course during the first week of program, CIT’s will apprentice in program areas for the rest of the summer, learning skills by being additions to the general staff members assigned to that area. As stated before, unlike previous summers participants in the program can spend their whole summer at camp for free, including the STAG leadership training course. They will even get the 25% Staff Discount at Spirit of Adventure Scout Shops to buy their summer uniforms and any other gear at the store. 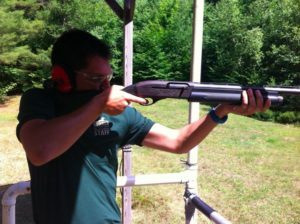 No other Boy Scout camp in New England offers a program like this for 14 year olds. Don’t miss out on this once in a lifetime opportunity to live the adventure at the Northern NeXus. As an avid camper myself, I’ve always been an adventure seeker. Philmont, Sea Base, mountain biking, skydiving, dirt biking, ice climbing, snowboarding, you name it, I’ve probably tried it! I love being at the center of the action, and when some friends told me about the plan for an all-new adventure base for our council, I knew I had to be a part of it. You see, while I loved summer camp, sometimes it just didn’t provide enough adventure to quench my thirst…. I would return every year, but eventually, the normal routine lost a bit of its magic. That’s why when I was asked to be the Rare Adventures Director, I knew that with the help of the Northern NeXus leadership team, we could make this something big. Being the adventure junkie that I am – but unable to pull myself away from the summer camp that had raised me – this was the perfect role for me to use my knowledge and love of the outdoors to bring those same experiences to scouts of all ages. Along with the rest of the leadership team, I promise every scout that enters a NeXus camp that they’ll get to enjoy a unique High Adventure experience, guaranteed! 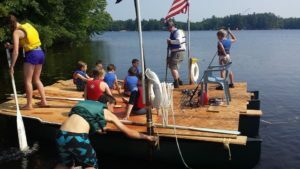 My vision is that, together, we can build a new standard for summer camp experiences, the likes of which has never been seen, and show all the other Boy Scout camps and councils that here in the Spirit of Adventure Council, Scouting Truly Does Thrive! Learn advanced sailing techniques on the Craig Ryder, exploring the beautiful and expansive Northwood Lake! Grab a friend and take on the allnew Vertical Caving Tower at T. L. Storer, climbing, crawling, and rappelling through a vertical maze! Gather your patrol or troop and head out to Parker Mountain for an overnight survival simulation! Units will even have the opportunity to work with the NeXus staff and build their own Rare Adventure. Whatever your path, you’re guaranteed a one-of-a-kind experience, only available at the Northern NeXus of Adventure. In addition to this incredible new program, scouts will be able to earn points for participating in Rare Adventures, which can then be applied towards earning the all new Spirit of Adventure Camping Award! Multitiered and comprising a number of different components, this award will be offered on the individual, patrol, and troop levels, giving scouts the chance to challenge themselves not only individually but also as a team, working together to obtain the never before seen Spirit of Adventure Troop Award! Scouts will receive patches and awards as they progress through the various levels. Jobs within the STEM (Science, Technology, Math, and Engineering) industry are growing at nearly twice the national average, meaning there will be well over 1 million unfilled tech jobs by 2020! Careers in STEM foster valuable 21st century life skills like problem-solving, creativity, and collaboration, while providing opportunities to create positive change and innovate a better world. Not to mention that it is fun. Bring your child to STEM Camp at New England Base Camp for chance to learn while having the time of their lives. The first time I went rock climbing was at summer camp. You had to be 13 years old and they only offered it on Thursday morning. I skipped Reptile Study Merit Badge to go and to give it a try. After all, I had been waiting to try rock climbing for 3 years. My response was an instantaneous love of the sport. A love that would stick with me for almost 30 years. We went back to the campsite and tested out our new skill using bailing twine and the cliff next to our tent. Needless to say, that did not go well. The next 25 years I would go climbing with the Scouts at summer camp, weekend climbing with friends and worked in the industry for a while. When my oldest came home from a school trip to the local climbing gym and wanted to go climbing all time, was when I determined that I needed to refresh my best practices. Even though I had learned new skills along the way, I knew that I needed to get better and safer. Picking the right climbing course (or any course for that matter) is not easy. I did not want one that was too basic. I also did not want one that was way over my head. 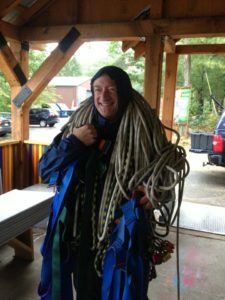 I looked all around, and in the end I decided on the Spirit of Adventure Climbing Course. For me, the reason was convenience. The timing of the course worked and the location was right for me. I was not sure what to expect, but my goal was to refresh my skills. I sat by two people that I did not know. On my left was a person who had never gone climbing before in her life and just wanted to “give it a try.” To the right of me was a former White Mountain Guide who wanted to get his certification to take his Scouts climbing. I was pretty much right between the two of them in my skill level, so the seat was perfect. The course succeeded with something that is not easy to do at all- they managed to relate and to teach at all the different levels. 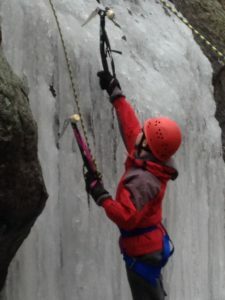 The person who had never climbed before, now takes her Scouts climbing regularly, helps out at Base Camp and is planning on taking her COPE certification. The former guide added a ton to the discussion during the course, helped everyone, learned several new safety skills and now teaches Climbing Merit Badge for units, districts and at Merit Badge University. I got something out of the course that you really cannot put a price tag on. I did learn a ton (more than I ever thought that I would) and it did help make my best practices a whole lot better. The biggest thing though, without question, is that I feel safe taking my daughters climbing. We have gotten closer by climbing together on the weekends and bonding over the difficult climb that they managed to climb. It may not feel like it, but soon the temperature will drop, the snow will fall and the water will freeze. There is not much one can do about it, we are in New England after all. Now is not the time to start to think about the ice damns on your house or the amount of snow that you shoveled last winter. It is time to think about what you are going to do to get those kids that will be stuck indoors outside! Winter is not the time to plan for only indoor activities for your family or Scout group. It is the best time to get outside and enjoy what Mother Nature has given us. Soon February vacation will be here and nothing is worse than being stuck inside with kids that are ready to be outside. 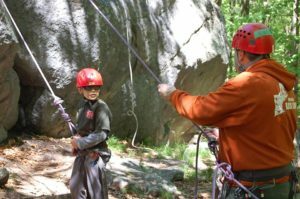 The Spirit of Adventure Council has opportunities for all ages of Scouts and for families to enjoy. With two different camps, both running out of New England Base Camp in Milton, your opportunities are almost limitless. Every weekend starting January 9th through the last weekend in February, New England Base Camp runs our Saturday winter program. Come for the day and learn how to build a quincy, go ice skating, spend the afternoon at the pool and enjoy a cup of hot chocolate around a camp fire as the sun is setting. If you are looking for more adventure, check out the ice climbing (as featured in this month’s Boy’s Life). 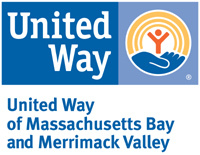 Call 617.615.0004 today, as limited space is available. So let’s PLAY outside! Grab those kids and join us at Base Camp to create memories that will last a lifetime. One of my fondest memories within Scouting was when we arrived at Worth Ranch in Palo Pinto, Texas, in the summer of ’87. It was not my first summer camp experience, it would be the most influential though. It was Father’s Day, it was about 100 degrees out and the parking lot was next to the swimming pool. We got out of the van and ran to look at the pool. The water was green and not just a little green. Every one of us looked from the water to each other with two thoughts going through our heads: “That water looks absolutely disgusting” and “When can we get into that water”. I really do not remember too many specifics of that week. I remember walking up Hernia Hill about 100 times that week. I remember going tubing down the Brazos River. What I remember most though was the staff, and one staff member specifically-John Briggs. He taught Swimming Merit Badge and was my favorite staff member that summer. At the end of that week, I had a goal in Scouting. It was not to get my Eagle and it was not to go to Philmont. It was to work the swimming pool at Worth Ranch. For the next several years, I went to camp every summer and every summer I knew that my goal was still to work the swimming pool. In the summer of ’91, I finally started to work staff. I did not know a single person on staff that summer. 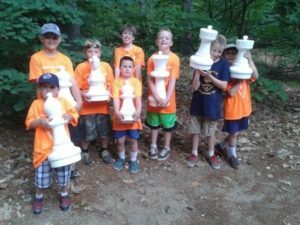 No one from my Troop had ever worked at camp before, so I really did not know what to expect when I arrived. I moved my stuff into my tent and went to the first meeting as a Worth Ranch Staff Member (just not at the pool). We played a bunch of games to get to know each other better and spent the week getting the camp ready for campers. That summer, I spent 8 weeks working at camp. It would not be for several years before I finally reached my goal of working at the swimming pool, but that did not matter. Along the way, I discovered something very important about working at summer camps. You get to know people better then you ever would have if you were not living together at camp. After a couple of days I got to know Mike, Jason, Chris, Travis and Daniel. That was over 25 years ago and I still talk to them on a regular basis. Even though we are spread across the world, we make sure to meet up once a year to reminisce about the “good ole days”. 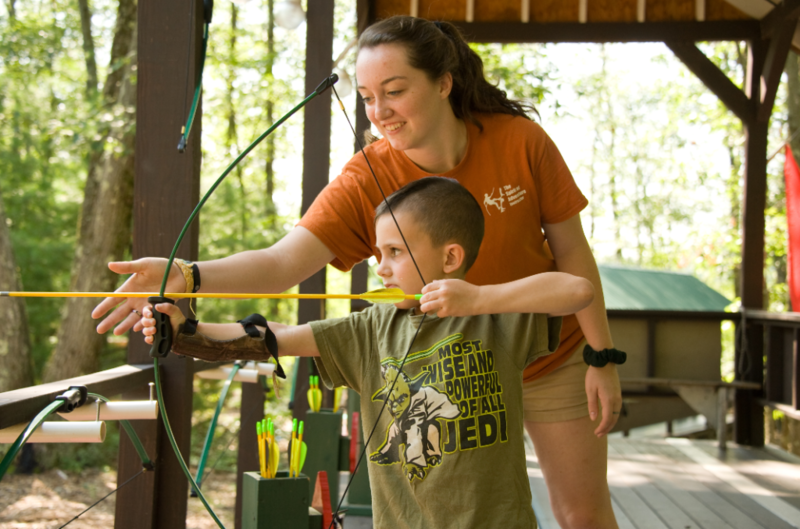 Working staff at a camp is more than just teaching pioneering or fishing. It is about discovering who you are and about making friends. I am forever grateful to John for being the type of staff member that made sure that kid wanting to take Swimming Merit Badge had a great time while he was at the pool and always said hi when hiking down the trail. Working staff taught me how to talk to adults and kids. It taught me Scouting skills and life skills. It gave me friends that I call family. And it allowed me to learn and to grow. 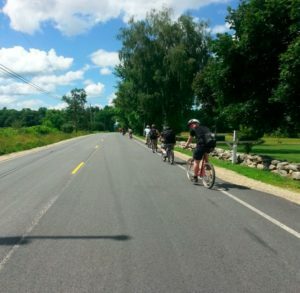 New England Base Camp has multiple staffing opportunities. Every weekend, our staff is ensuring that our guests have the opportunity to be out in nature learning new skills. Each summer, you can chose between any one of the seven different locations to apply and work. Working camp will be the best decisions you have ever made.